Solid marble balustrades which are the same as Model BS102 but with hand finished rope center and delicately carved acanthus leaf finish. A little more expensive but a little more quality but still the best Marble price in America, just show this to your builder and watch his expression. He pays just a little less for concrete balustrades. Which would you rather have? SKU: bl103. Category: Hand Carved Imported Solid Marble Balustrades. 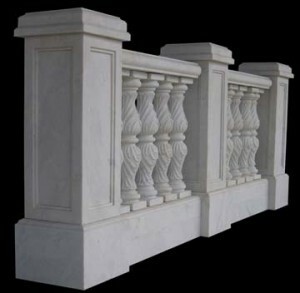 Tags: hand carved marble balustrades, imported marble balustrades, marble balustrades, solid marble balustrades.